At last, a way to improve your Tagalog! 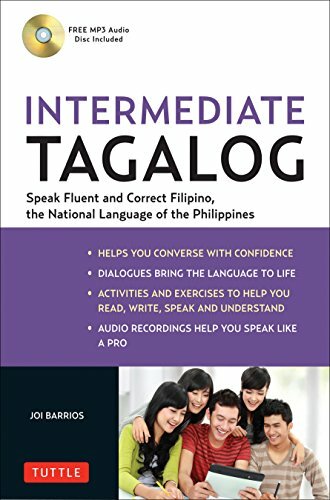 Written by Joi Barrios as the continuation of her best-selling Tagalog for Beginners book, Intermediate Tagalog is the first intermediate-level book designed specifically for people who already speak or understand some basic Tagalog and now wish to achieve greater fluency in speaking, reading and writing standard Filipino—the national language of the Philippines. The carefully-constructed lessons in this book point out common grammatical errors that English speakers make when speaking Tagalog, and present "real-life" conversations demonstrating how the language is spoken in Manila today. Extensive cultural notes are provided, along with exercises and activities that introduce the use of the Tagalog language in a wide range of everyday situations. The 20 lessons give you all the basic skills needed to speak Tagalog fluently: paglalarawan (the ability to describe people, places and feelings); pagsasalaysay (the ability to tell a story—whether a news story, a folktale, or an anecdote); paglalahad (how to explain something—for example, a custom or tradition, or how to cook a dish); and pangangatuwiran (reasoning and abstract thinking). A "real-life" dialogue providing valuable conversational skills. A vocabulary list to expand your familiarity with common, everyday Tagalog words and expressions. A grammar review section (for example, on the correct uses of affixes in various sentence constructions). Insightful cultural notes presenting aspects of the Philippines that may seem "odd" to outsiders, to explain how Filipino culture shapes the way people speak. A reading passage from a story or newspaper article, with comprehension questions. A writing exercise designed to teach a specific writing skill. Using Intermediate Tagalog, you'll be able to talk about yourself, your family and your daily experiences using grammatically correct sentences and a native-speaker level vocabulary.